As recently as maybe one hundred years ago, average life expectancy was forty-something. It was shorter for women and longer for men. Marriage, childbirth and maturation thus occurred much earlier, in life, than it does today. Why are some teeth wise? Wisdom emerged at the same time as third molars erupted. Thus, coincidences lead to the nickname, wisdom teeth. Today, third molars would need to erupt at roughly age thirty (sic) to match maturation, maybe even later or never, to maintain the age-old pattern. Under the gums, impacted third molars can cause great pain as well as possible infections. Alternatively, the third molars may erupt, causing even more pain and another chance for infection. That's why most people have two, if not all four, wisdom teeth removed at the same time. 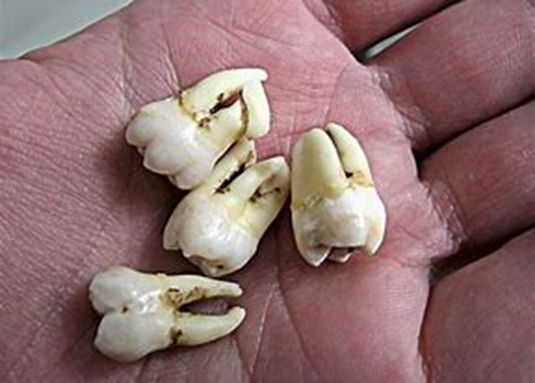 When I was 17, my dentist said my wisdom teeth had to come out; otherwise, there would be problems with my teeth later on. My mother made an appointment for me at the oral surgeon and I told my job that I wouldn't be in for the next two nights after the teeth came out. I thought I'd actually be able to go to work, but my mother said there was no way it would happen; I would be in too much pain. I just nodded my head and thought that she was wrong. Was I wrong and I knew it, in no time flat. I attend my appointment and no one is tells me what is happening. I go into a room, am shot full of Novocain, a mask put on my face for the sweet air and then the anesthesia. The next thing I know, I'm fully awake, looking straight at a very attractive blonde nurse. She tells me not to worry; they're putting me back to sleep. Shortly afterward or so it seemed, I'm awake, again, feeling loopy and a great deal of pain. My mouth packed with gauze, my lips and face numb. It was then that I truly realized I wouldn't be going to work until the following week. The oral surgeon told me they had to wake me up because I was turning white. I asked about the blonde nurse. He said that there wasn't one. I guess I hallucinated during my drug-induced haze. My mother took me home. She gave me a couple of ice packs and Tylenol. Then let me sleep. My oldest daughter Michelle was 16 when she had to have all four wisdom teeth pulled at the same time. My wife took her to the oral surgeon that my father-in-law had previously used. She rested for four days, afterward, and was fine. She isn't much of a complainer, thank goodness. Daughter number two was different. Melissa, my younger daughter, is the opposite. She knew from her previous dentist visit that those annoying molars were going to have to come out. We were hoping to make it through the summer, so molar removal would occur between when camp ended and before school started. No such luck, Melissa went to the dentist because they were bothering her. He said her molars had to com, ASAP. I called the same oral surgeon that Michelle used, but they didn't have any appointments until the end of August; that wasn't an option. I called the oral surgeon the dentist recommended. He had an appointment the following Thursday. I took that opening, knowing that Melissa had to leave camp early, not go on Friday, and wasn't going to be able to go to work on Sunday. Melissa was nervous, but not freaking out, as she can do, because she knew that this had to happen. When we go to the office, she filled out some paperwork and went into surgery. I joined her a few minutes later. The doctor explained that she was having this done at the perfect time, as the roots to the teeth had not yet developed. This would be an easy extraction. Easy for whom, I wondered. I went back to the waiting room. I waited, and waited some more. My wife called a couple of times. I told her this was at least an hour to two-hour procedure. I'd call her when we left the surgeon. Finally, the assistant takes me back to see Melissa. She is so loopy it's funny. She's laughing and crying from the pain at the same time and telling me that the doctor was dissing her during the procedure. She mentioned that to him. He said that was the anesthesia talking. Melissa and I finally go to check out, where the nurse gives me the bill. Well, there goes our mini vacation this year. Then the nurse tells me where she sent the prescriptions to a CVS. It was the wrong CVS. She had to cancel that and send it, again, to the correct CVS. Melissa is full of gauze, and can hardly talk. The gauze has to stay in until the bleeding stops. She must change it quite often. She also has to use ice packs to minimize the swelling to her jaw. By the time we get home, she is not in a good mood. CVS finally calls and my wife goes to pick up the prescriptions. She comes back with only one, the painkiller Hydrocodone. Melissa has to take one every 4-to-6 hours, which she does for the first three days. After that, it's making her too tired. What happened to the antibiotic, Clindamycin? That went to the wrong CVS and Jean, our pharmacist, had to get it transferred to her store. Michelle went to get it. I've taken Clindamycin, the antibiotic. I know what it's going to do to Melissa. Side effects, of Clindamycin, include an upset stomach and diarrhea. The Hydrocodone, which causes constipation, offsets the Clindamycin. You can’t win. Melissa starts complaining about her stomach. We keep telling to have something to eat, but she's not hungry, even for ice cream. Boy, she really isn't feeling well. Don't let anyone tell you anything different. Removing third molars, having your wisdom teeth removed, is surgery and not a minor procedure. Anytime drills, pliers, needles, anesthesia and painkillers are involved, that's surgery.